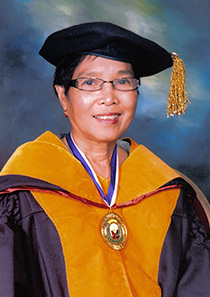 Dr. Liwayway M. Engle is recognized for her significant contributions and leadership in the field of conservation and utilization of plant genetic resources, especially vegetables. Under her stewardship, the vegetable genebank of the AVRDC-World Vegetable Center further expanded its extensive collection of vegetable germplasm, especially tropical vegetables indigenous to the Southeast Asia, of more than 10,000 accessions and various information on the collection made available to the world through the AVRDC Vegetable Genetic Resources Information System (AVGRIS) website. Further, she pursued vigorously the reintroduction and use of these indigenous vegetables into cultivation through multi-country projects in Asia. Her module of indigenous vegetable gene banking and utilization has been adapted by other countries in Central Asia and in Africa.